We are very proud of our corporate sponsors! Thanks to the steadfast support and commitment of our sponsors, Stedelijk Museum Amsterdam remains one of the country’s most influential museums. Our sponsors help us maintain our reputation as a destination for art, inspiring more than 600,000 people a year (many of them young) to visit us to discover and experience art. Our sponsors share our belief that our world-famous collection, dynamic exhibitions and educational programmes challenge you to question what you know, and to see yourself – and society – in a whole new light. Inspired by this vision, the Stedelijk Museum and the Stedelijk sponsors look to the future with curiosity and confidence. 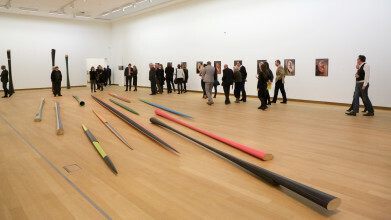 The partnership between Audi and the Stedelijk Museum began before the reopening of the renovated museum in 2012. Audi supports the Stedelijk in our mission of staging audacious solos by a young generation of artists. In promoting new visions in art, the exhibition series often features new productions and recently acquired works, and reflects current concerns. The longstanding support of Freshfields Bruckhaus Deringer is vital in maintaining the Stedelijk’s position as one of the world’s most renowned museums. Our fruitful partnership is built on a shared goal: to connect with new audiences. Thanks to Freshfields – that hires our iconic spaces to host unique receptions – we’re able to share our collection with more people, which underlines our mission to enrich the lives of as many people as possible with art and design. ProWinko has been an incredibly supportive partner on a number of exceptional projects. The company provided technical support throughout the ambitious Jordan Wolfson solo in 2016 and 2017, which featured animatronic sculptures. ProWinko also made a significant contribution to Stedelijk Base, enabling us to install the work of Barbara Kruger. We would not have been able to display the piece without the help of ProWinko. With an appreciation of beauty and craftsmanship, Illy’s corporate culture complements the mission of the Stedelijk Museum and its collection of contemporary art. More than 100 internationally-distinguished artists created designs for the coffee cups of the Illy Art Collection. The partnership between G&S Vastgoed and the Stedelijk Museum first began with the creation of the new museum wing in 2012. Both parties have remained close collaborators ever since. With property developments throughout Amsterdam, G&S Vastgoed contributes to the capital’s iconic cityscape, with characteristic architecture designed for pleasant living and working. Zumtobel Group and the Stedelijk Museum worked together on a lighting design uniquely tailored to the needs of Stedelijk Base, the new installation of our world-famous collection. We are grateful to the Zumtobel Group for providing the expertise, innovative technologies and products needed to display the artworks to best advantage. The lighting design is integral to creating an unforgettable experience for our visitors. Our new entrance area has been designed to offer visitors a welcoming experience, and inspire new audiences to admire our collection and discover the Stedelijk. The high-tech video wall in the lobby allows us to feature video works from our collection that would otherwise remain in storage, and unseen. Together with Zumtobel Group, the Stedelijk Museum Amsterdam realised an optimal lighting design for the innovative arrangement of the world-famous collection of the museum at 'Stedelijk BASE'. Thanks to Zumtobel's expertise, innovative techniques and products, the artworks are at their best. The lighting design contributes to the high quality that the Stedelijk aims for with its activities and the special experience for our audience.